A Scot, who is facing a three-year jail term in Dubai for putting his hand on a man in a bar, has appeared in court. Jamie Harron, from Stirling, was summoned to a hearing on Sunday after he reportedly failed to attend a previous court date in the city. The 27-year-old was arrested for public indecency following an incident at the Rock Bottom Bar in Dubai on 15 July. Despite fears he would be rearrested, Mr Harron was freed but told to remain in the city for future court dates. The electrician, who had been working in Afghanistan, was on a two-day stopover in the United Arab Emirates when the incident happened. He claims he was trying to avoid spilling his drink in the crowded club and was holding his hand out in front of him when he inadvertently "touched a man on his hip to avoid impact". He was reportedly locked up for five days in Al Barsha prison, before being released on bail and having his passport confiscated. 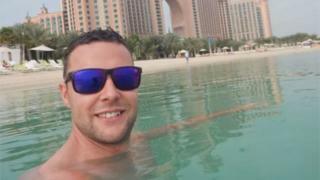 A spokeswoman for the charity, Detained in Dubai, which is representing Mr Harron, told the BBC she had expected him to be rearrested at court on Sunday for his previous non-appearance. She expressed relief that he had been freed. However, said he still faced future court appearances for the original charges relating to public indecency and consumption of alcohol. Radha Stirling, chief executive of Detained in Dubai, said: "Jamie is relieved he wasn't arrested at the latest hearing. It was expected that he would have to spend some time in prison." Ms Stirling said a further court date was expected in about two weeks, although no firm date had yet been set. The Foreign and Commonwealth Office said it was providing consular assistance on the matter. The arrest follows the case of an Edinburgh man who was also detained in Dubai after attempting to exchange a fake £20. William Barclay, from Edinburgh, returned home on Friday after being held in a Dubai jail for three days during a family holiday.